This is the next step for progressing kids. A very light performance rig at an affordable price. RBS Battens. Current available color pattern is Red/Black/White. 3.0 or 3.5 size. Includes Ezzy built sail, reduced diameter epoxy mast, Kid Boom, 1-Bolt Tendon US Mast Base, Skinny Alum Extension, and Up-Haul. This is the next step for progressing kids with the added benefit of a Carbon Mast. A very light performance rig at an affordable price. Majority of X-ply material combined with Dacron is very light yet extremely durable. 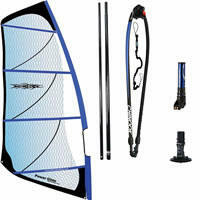 Endo-batten seam shaping with RBS Battens helps to create a powerful sail that is tunable with screw-adjusting batten tensioners. 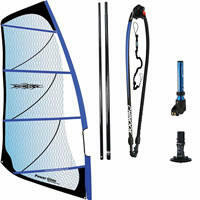 This upgrade package includes an Ezzy built sail, 2-piece Carbon 60% Reduced Diameter Mast, Kid Boom, 1-Bolt Tendon Mast Base, Skinny Alloy Extension, and uphaul. Current available color pattern is Red/Black/White. 3.0 or 3.5 size. 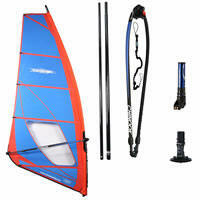 Two Sail Package! 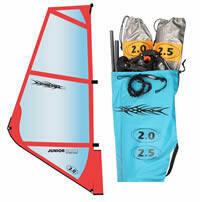 The Junior Glide kids rig is a simple and durable design. It is so light that kids become comfortable light wind sailors in the first hour or two. 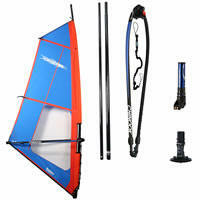 Includes 2-Sails, 2pc alloy mast, Chinook kid boom, 1-Bolt Mechanical Mast Base, extension, uphaul. 1.0-1.5 or 2.0-2.5 package.